Back in January I attended the London Summer Event Show and particularity enjoyed one of the sessions about summer food and event design, chaired by Will Broome CEO of Londonlaunch. The panel discussed the latest trends in summer foods and service styles ranging from very casual “street food” to more sophisticated “celebrity chefs”. 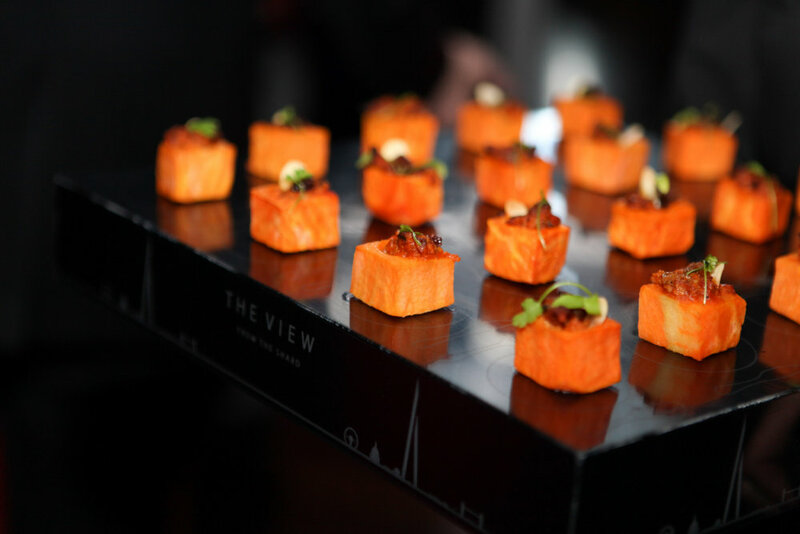 I have decided to research the topic and asked the catering company The London Kitchen, also one of The View From the Shard approved suppliers, what do they see as the dining trends for 2015. According to Damian Clarkson, Managing Director of The London Kitchen, the London dining scene is constantly changing, and this year a host of new cuisines and unusual ideas are set to take the city by storm. In turn corporate entertaining will take on a brand new look, as events industry professionals take note of the newest and most innovative ideas on the food scene. 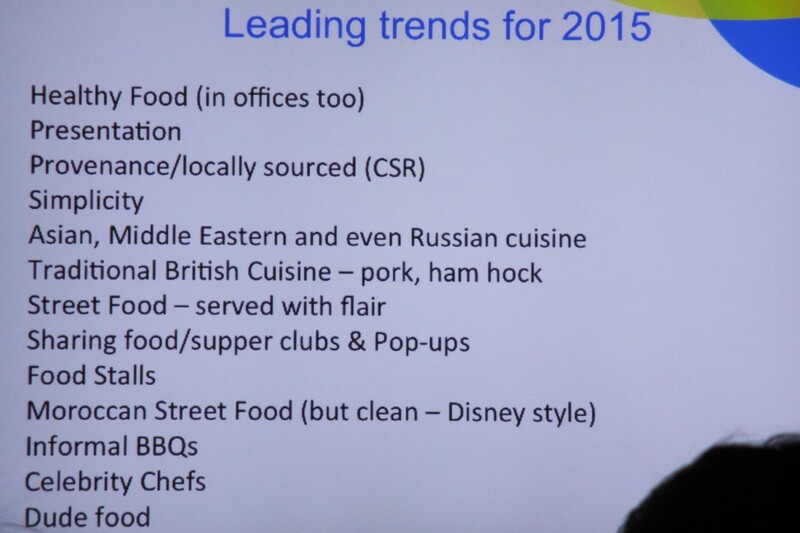 Last year we saw an explosion in popularity for street food, something which will continue in 2015. We’re also looking forward to the unveiling of some very interesting new technology – 3D printing is the one to watch. Here’s how to take your event catering to the next level with our top ten foodie trends. Yes, really, edible printing! This innovative new idea is set to really take off in 2015. We can’t wait to get our hands on one of these machines, digital dining is finally within reach! Coconuts are in vogue once more – and not just the humble coconut itself. We’re also experimenting with coconut oil, and rehydrating with coconut water. It’s easy to see why this exotic treat is so popular, its benefits range from keeping our hearts healthy to suppressing appetite, making it just perfect for that January health kick. Every new year needs a new grain, doesn’t it? Well this year’s top spot is set to be taken by freekeh, a toasted young green wheat popular in the Middle East. It’s got a chewy texture and a lovely smoky flavour. It’s healthy, cooks quickly and it’s easier to make than rice. Want to hear the best bit? We’ve begun to see it appear in supermarkets already. Whilst Filipino food remains a popular cuisine, it’s beginning to be taken over by Korean BBQ. Chow down on kimchi and bulk up on bi bim bap at one of the capital’s new hotspots. We love Koba in the West End and Asadal, which you’ll find near the entrance of Holborn station. Londoners have become accustomed to bigger, bolder flavours over the past few years, and this is set to take on a new twist in 2015 when restaurants begin introducing new fusions and flavour combinations to get us talking. The focus here is on simplicity, with dishes heavily influenced by Asian ingredients. This year the health conscious amongst us will be raving about birch water. This new plant-based drink is high in electrolytes and potassium, which help rehydrate, but devotees make other bold claims, saying that it can help treat conditions including liver disease, constipation, flu, headaches, dandruff, eczema and cellulite. Could the rumours be true…? We’ll have to wait and see! The humble roast chicken becomes haute rôtisserie this year, with many of the capital’s finest restaurants putting a Michelin spin on one of our all time favourites. Well, you can’t beat a good roast, can you? Bitter flavours are becoming more popular, and we’ve got mixologists to thank for that. Top bars are serving more bitter cocktails, which has attributed to a rise in popular of other bitter foods. A key ingredient to watch is pomegranate – it’s great in salads giving a sweet yet bitter hit. You might see a lot more liquorice this year, too. Coffee bars have been big news for years, but the humble pot of tea seems to have been a little forgotten. This terrible oversight will be righted this year, with plenty of luxury tea bars springing up across London. We’ll be first in line. “Waste not, want not,” say the restaurateurs of London town. And we’d have to agree on this one. This year will see more of an emphasis on lesser-used products, such as offal, with the city’s most talented chefs set to show us exactly how delicious these ingredients can be. To this comprehensive list I can also add that I see a trend towards brain-food, vegetarian and vegan which is constantly growing and gaining popularity in the UK and across Europe. I believe that sooner or later we will see more of its adoption in corporate hospitality, too. What other catering trends do you think will be popular in corporate hospitality?